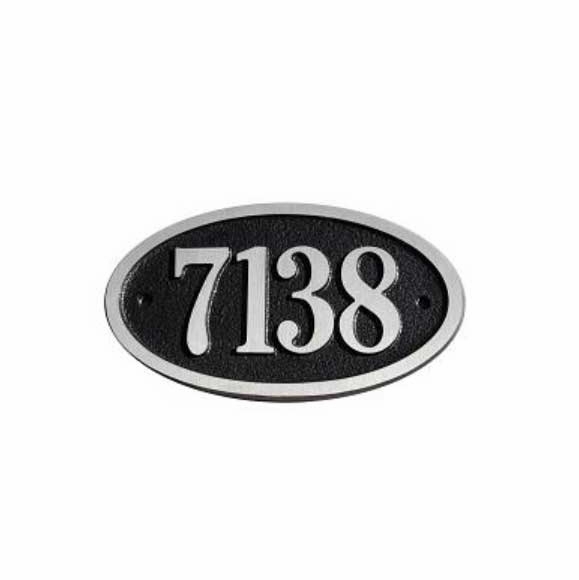 Small Oval House Number Sign - - one-line address sign holds up to four (4) 3" characters. Made in USA. Solid cast aluminum construction and in your choice of 16 plaque colors. Plaque colors: forest green (1), gold (2), ruby red (3), navy blue (4), black (5), rust (6), burgundy (7), deep purple (8), silver vein (9), brilliant white (10), copper vein (11), patina (12), gold vein (13), white vein (14), bronze (15), natural stone (16). Characters and border color is aluminum.